The Han 34 HPR EasyCon offers rail operators a 650A connection capability with the ability to handle big data in harsh environments. 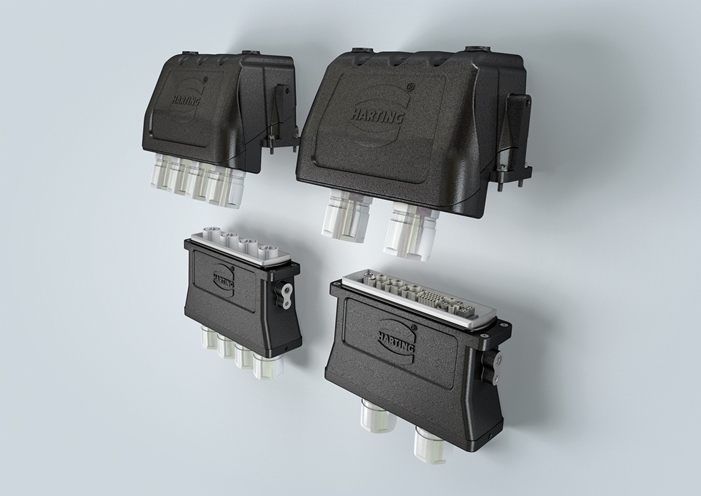 HARTING has introduced the Han 34 HPR EasyCon – a new connection product for increased environmental demands in the high-current range. This connector has a high power density, making it particularly suitable for use in rail vehicles eg carriage transition (angled version) and connections to traction unit engines (straight version). Han 34 HPR housings and retaining frames are designed in such a way that, for the first time ever, they can now accommodate four 650 A contacts alongside one another in a single interface. This more than doubles current-carrying capacity compared to the next HPR connector size down, saving the customer space. However, the housing dimensions have not increased to the same degree: the housing width only grew by a third compared to the smaller alternative. 12 Han-Modular individual modules can also be inserted as an alternative to the 650 A high-current contacts. Until now, two housings equipped with 6 Han-Modular individual modules each had to be used to obtain a comparable power supply. The series offers over a hundred different inserts for the transmission of Power, Signal and Data, enabling countless combination options. Intelligent modules in the smart Han range complete the offering: the ID module gives rail components an identity that can be called up on networks. In addition, networks can be extended by integrating the new 4-port Ethernet switch US4, using only little space.